With so many betting shops on the high street, William Hill have a solid reputation in the sports betting world. It’s no surprise therefore that they have an impressive online presence too. The William Hill site is packed with betting opportunities, excellent promotions and lots of live action to place bets on. This is one of the biggest bookmakers in the world and you can see why with streaming, massive market range and depth, great offers and new and inviting features and promotions year round. There are three £10 free bets waiting for you when you sign up with William Hill. Signing up isn’t something that’s going to take very long, just the usual set of questions you’ve probably answered plenty of times already. The important task is to use the C30 bonus code as that gets you on your way to the welcome offer. Make your initial deposit and then place a win bet which is at least £10. If it’s an each-way selection it has to be £10 each-way, £5 each-way doesn’t count. The odds of your selection must be 1/2 or greater. When it’s settled there will be 3 x £10 bets winging their way into your account. When those are used you only receive back your winnings not the stake as well. So if using your £10 free bet on a selection priced 3/1, you have £30 added to your account not £40. There’s a whole stack of markets available at William Hill. Everything is really laid out well so from the moment you arrive at the home page everything is ready and waiting for you to start placing bets on. It’s not just the top events like the Premier League or ATP tennis tournaments that you can make selections on. There’s plenty of betting opportunities that involve teams and individuals you’ve probably never heard of but will be delighted when they win for you. At the top of the page is a long list of all the sports they cover. Just click on what you’re interested in whether it be football, cricket or a spot of volleyball and that section will come up with a list of all the betting markets that are available for you to place bets on. If it’s horse racing that is your passion there’s plenty of action for you to be betting on. All the racing in the UK and Ireland of course but also races from the USA, South Africa and France. That means action around the clock at William Hill. When it comes to odds, William Hill really do give some excellent prices. Best odds are guaranteed when it comes to horse racing For other sports they offer highly competitive prices and as you’ll read there are always some excellent promotions available. You’ll be expecting to be placing bets on all the top events that happen around the world but how about putting a bet on something a little bit out of the ordinary? There are plenty of opportunities to do that at William Hill and it’ll certainly give you a bit of entertainment and hopefully a good profit too. Will the official caterers run out of strawberries at Wimbledon? As well as placing bets on what’s happening now or in the next few hours, there are plenty of ante-post betting opportunities at William Hill. So if you fancy betting on who’s going to win the Derby next year or be the next England manager, just go to each section of the site and there’s lots of ante-post markets. While ante-post betting can give you plenty of enjoyment, particularly if that great tip you had comes in, live betting is one of the most exciting forms of betting out there. It’s far more interactive than the days when you just placed a bet before the event started and then followed it having no way of placing any further bets. With live betting the odds are fluctuating all the time and you can either try to win some more cash or rectify that initial bet that isn’t looking so good now. At William Hill you’ll find a large range of in-play betting opportunities available and it doesn’t matter what time of day it is. You can be betting on stateside action in the early hours of the day and then events from the Far East in the morning before all the UK betting opportunities begin. Forget all that frustration of taking a price and then seeing your selection go on to win or get placed at higher odds. At William Hill they offer Best Odds Guaranteed on UK and Ireland horse and greyhound racing. They also offer this on races in other countries at times. That means they will pay you out at the SP if that’s higher than the price you took and that can get you some higher profits. You can also get bonuses if your horse wins by 2 or more lenghths in the flat season (2 Clear 15% win bonus), or five more lengths in the jump season (High 5 – 25% win bonus). The site has plenty of promotions during major tournaments and the regular football season. There are always some excellent enhanced prices available so if you are lucky it might just be possible to get that bet you want on at a much better price than with other bookmakers. You can also get insurance on accumulators that you place. If you select five teams and just one lets you down (as sadly is so often the case) then you get your stake refunded as a free bet. Other offers have included free bet refunds on correct score selections when the game ends goalless. All customers who bet £20 or more each week (By 23:59 Thursday) on a football accumulator with four or more teams in it will be given a £5 free bet as part of the new William Hill Offer Club. Qualifying bets can be either one 4+ fold accumulator of £20 or more or several smaller multiples so long as £20+ is stakes in the week. Free bet is valid for the next seven days and you can claim each and every week. Having a bet and waiting till the final whistle blows really can be nerve-wracking and not just if you’re an England fan. With Cash Out life can be so much easier. Imagine if you’d decided to cash out your bet when England were beating Russia in the European Championships? How wide would your smile have been when Russia got that equalizer in the last minute? You’d have got a lot more back than if you’d waited till the final whistle and seen that win bet go down. That’s the magic of Cash Out and thankfully it is available (along with partial cash out) at William Hill, so another reason to join the site. 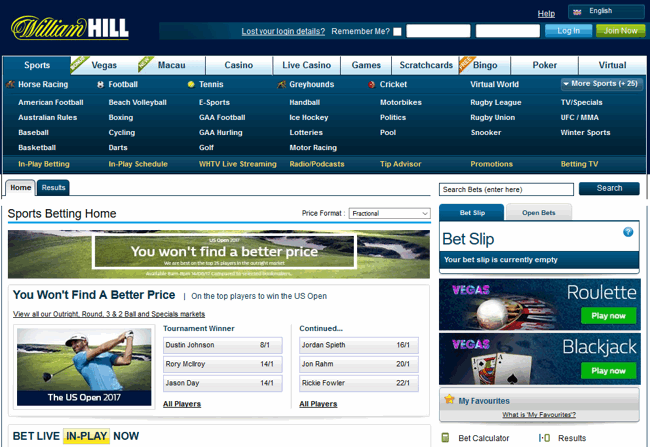 You will find that there is lots of help available on the William Hill site. In the right hand corner of the screen is the Help button. If you have any questions about the site simply click on that and a help page comes up. This has lots of sections and you’ll quickly be able to get an answer to the burning question that you may have. If that doesn’t sort your problems out then there’s live chat available or you can call/email them.